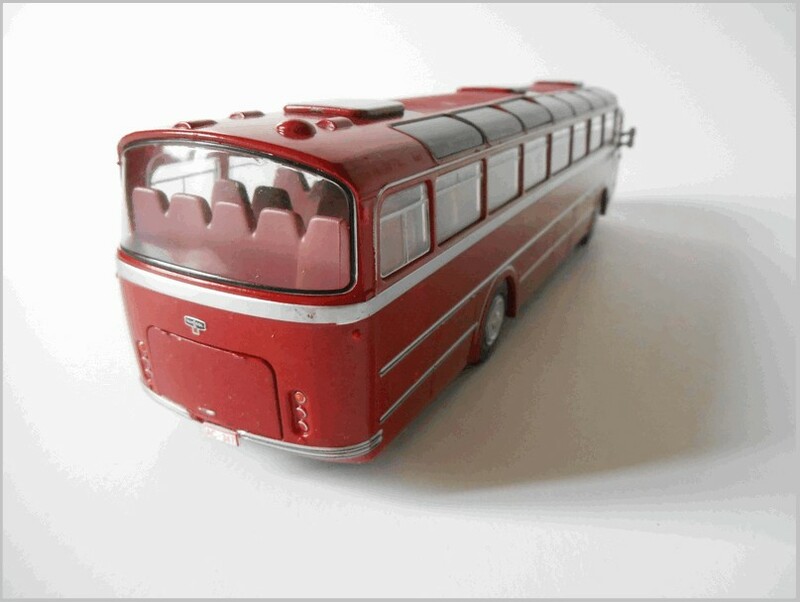 Here we look at Autobus from the world – part seventeen (nos. 49 – 51). After Brossel (see part 12, no. 36), now it is time to explore another Belgian manufacturer, the famous Van Hool, then we have one more Citroën bus and another previously seen German manufacturer Neoplan. 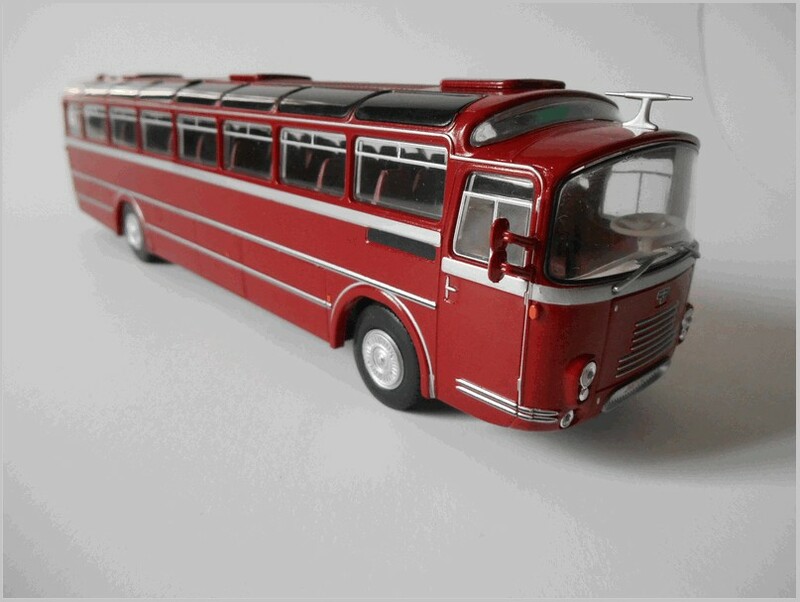 All of them are from the Italian Hachette partwork “Autobus dal mondo”, a collection of eighty 1:43 scale bus models, very similar to the French one “Autobus et autocars du monde”, produced in Bangladesh for Ixo. No. 49 (no. 38 in the French collection) Van Hool VHF 306 Vistadome 1961 – We have already seen how the Belgian automotive industry is often overlooked, but is a thriving and dynamic one. Bernard Van Hool was born in Koningshooikt (near Anversa) and as a young boy he took a great interest in mechanics, construction and electrics. An active entrepreneur, he started a diamond cutting factory, then a company making other machinery, but the Second World War destroyed everything and he found a new challenge in the transport sector. His ambition was to build bridges and roads, and he needed a vehicle to transport his men to the works, and he decided to rebuilt an old bus with a whole new body. That was the birth of a new challenge: building coach bodies and running a coach tour operating company. He was successful and in 1957 a commercial agreement with Fiat was signed. Van Hool would use Fiat engines and other mechanical components in its vehicles. Van Hool developed from being a small coachbuilder to a manufacturer of integral buses and coaches, known as Van Hool-Fiat (VHF), whilst continuing to also be a renowned coachbuilder. This cooperation was a great success, introducing series production (over 500 coaches by July 1961) and they were exported all over Europe and Africa. In 1981 the cooperation with Fiat was terminated, and Van Hool started to use engines and axles sourced from Caterpillar, Cummins, Mercedes, DAF and MAN and gearboxes from ZF or Voith, or using whole chassis from Volvo and Scania. Since the mid-1980s, Van Hool has also been active on the North American market. In 1990 Van Hool purchased the coachbuilding business of LAG Manufacturing, a Belgian company founded in 1947 by two Geusens brothers that had achieved some success in the United States. Under the new management the product line was expanded. In recent years, Van Hool has been focusing on new propulsion technologies, introducing fuel-cell hybrid buses as well as diesel-electric hybrids. The VHF 306 is part of the first generation of buses born from the agreement with Fiat : a fast and well made design allowing an early success and the subsequent expansion of the company. 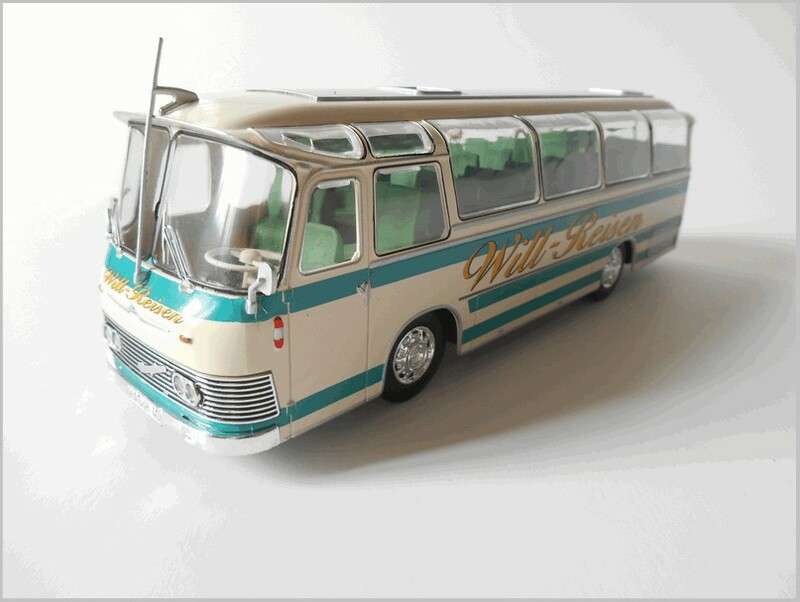 The first bus was the VHF 682, the chassis had bent sheet metal beams and the body was welded to it, with a single piece windshield and a very low horizontal radiator grille. The engine was a straight six diesel of 10.7 litres and 150 CV (the same used by the Fiat 682 RN bus), placed horizontally between the axles. 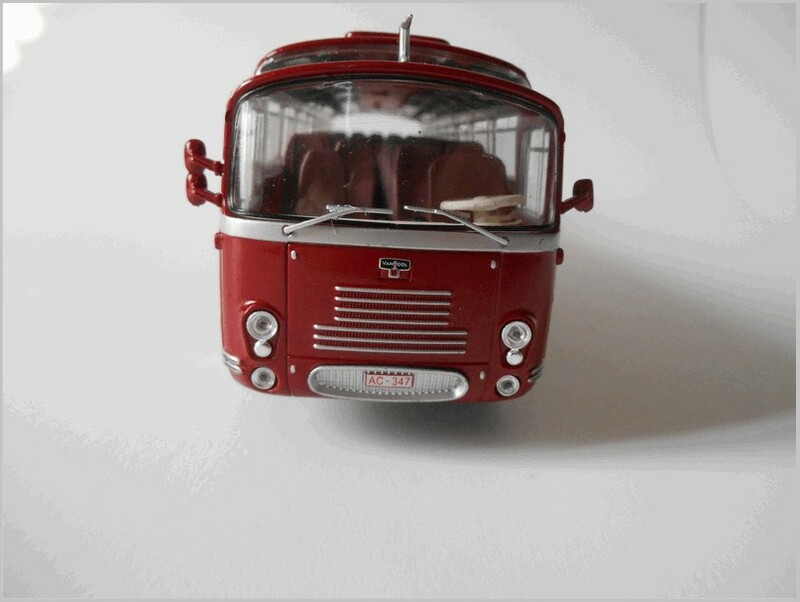 Some countries didn’t allow its 12 metres body length, so a new 11 metres bus was developed in 1959 and named VHF 309, while the 682 was renamed 306. Later on they developed an extra-luxury version of the 306, the Vistadome, with an elevated floor for the passengers and a second windshield over the main one. 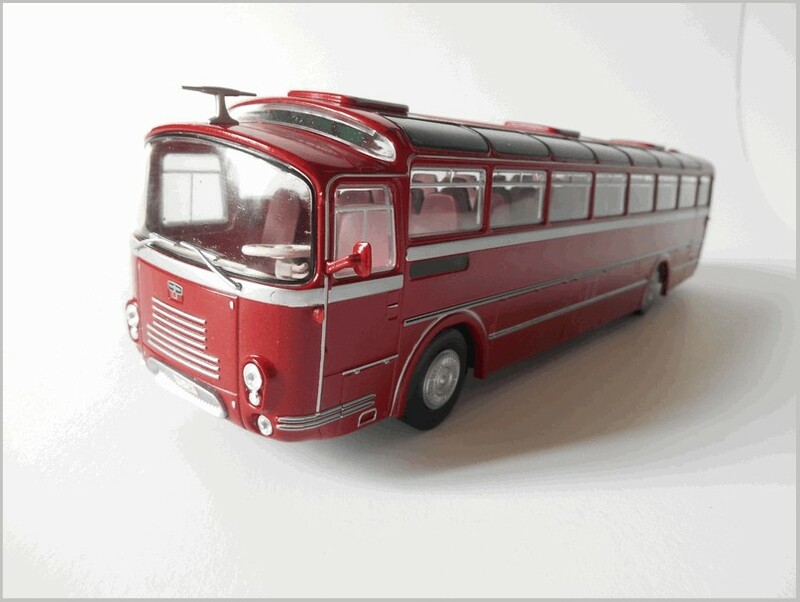 The scale model is based on the Vistadome version, with the usual combination of a plastic body and a well detailed metal baseplate, sporting a dark red livery. The registration plate is correct for Belgium (red characters on white background) and very likely also for the year: Belgian plates are owner specific, giving no reliable information about the original registration year of the car to which they are fixed. 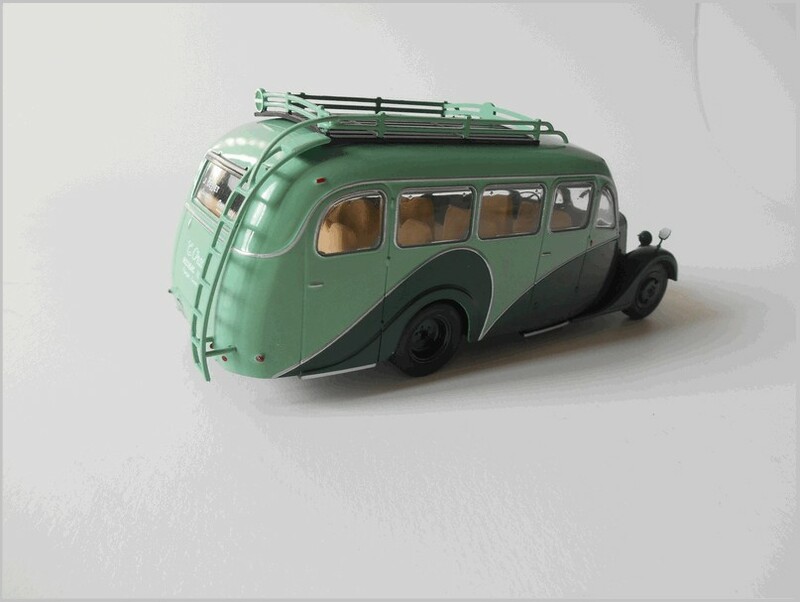 The body shape is well reproduced, with nice side windows and tinted ones on the roof, and a separate antenna. As usual there are many separate plastic parts, like side exhaust, lights, mirrors and wipers. The interior is quite basic, with the steering wheel being perhaps a bit too large. The rear wheels rub on the body though this could be specific to my model). There is no apparent difference to the French edition. 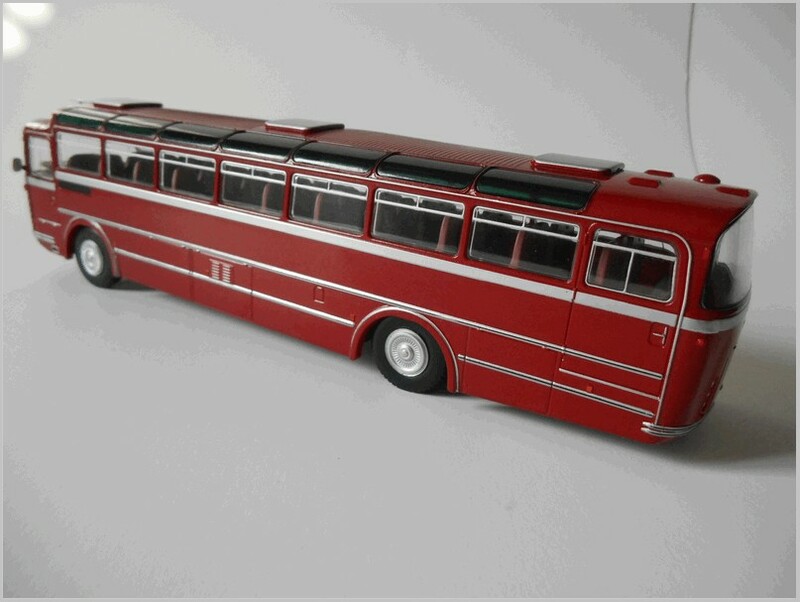 A really big model of a large tourist bus typical of the 1960s. No. 50 (no. 39 in the French collection) Citroen U 23 Besset 1947 – We have already seen the history of André Citroën and its type 46 (see part nine, no. 25), and how in 1953 the type 55 (part three, no. 9) replaced the type 45 (part two, no. 6). 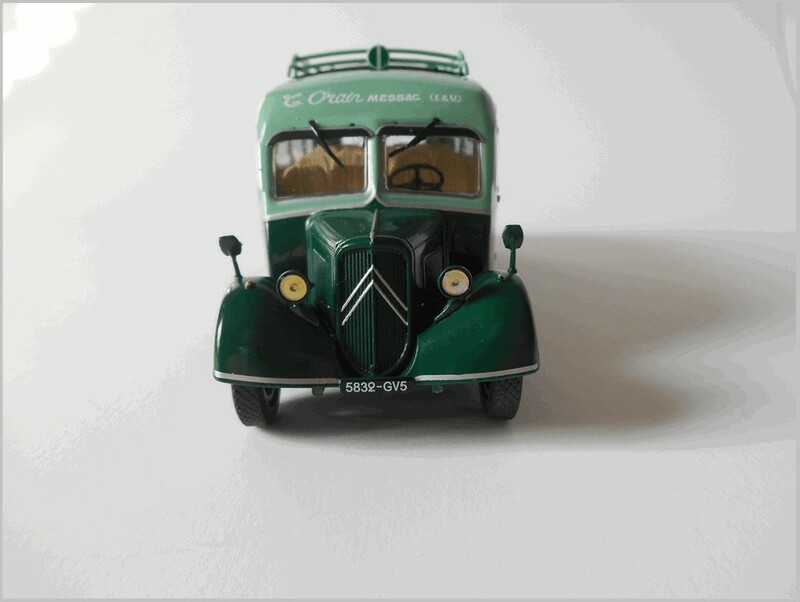 Before the Second World War Citroën developed a homogeneous range of commercial vehicles formed by the types 29 (later 32) and 45, based on truck derived chassis and designed to be bodied as long distance buses, plus a little brother, the light truck type 23 (see part five, no. 15), based on the type 11 and powered by the Traction Avant engine, obviously flipped around in order to drive the rear wheels through a specific gearbox and with an inverted direction of rotation to maintain the direction of rotation of the crank. But its power was quite poor, it gave a maximum speed of only 65 km/h and allowed only 14-20 seats. 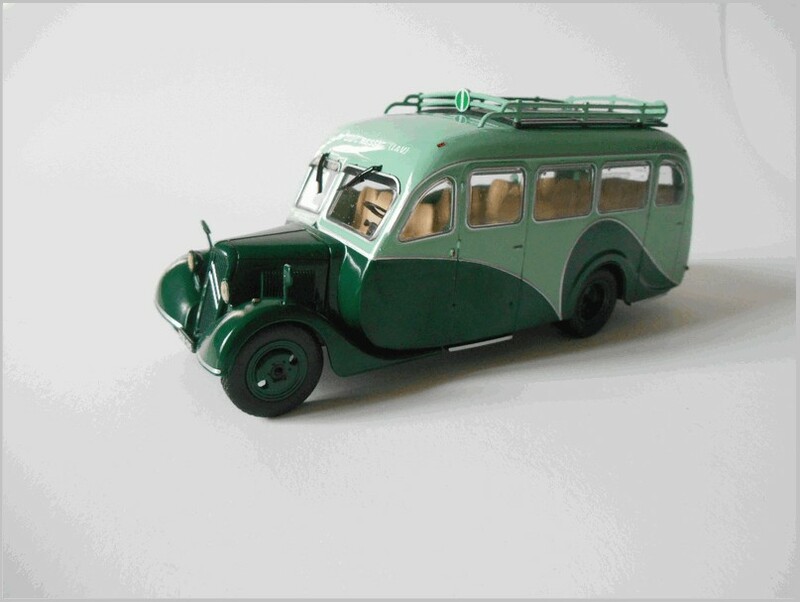 Presented at the 1935 Paris Motor Show as a light truck, quite basic but very reliable. Many coachbuilders showed their proposals for the 23, like Surirey of Flers (Orne) still active in the field of commercial vehicles, or Besset of Annonay (Ardèche), author of our model. Joseph Besset started as a wooden wheel maker and in 1920 founded an industrial body shop adding coachwork to chassis from Berliet, Bugatti, De Dion Bouton, Delage, Hispano-Suiza, Renault, Rochet-Schneider and Rolland-Pilain. 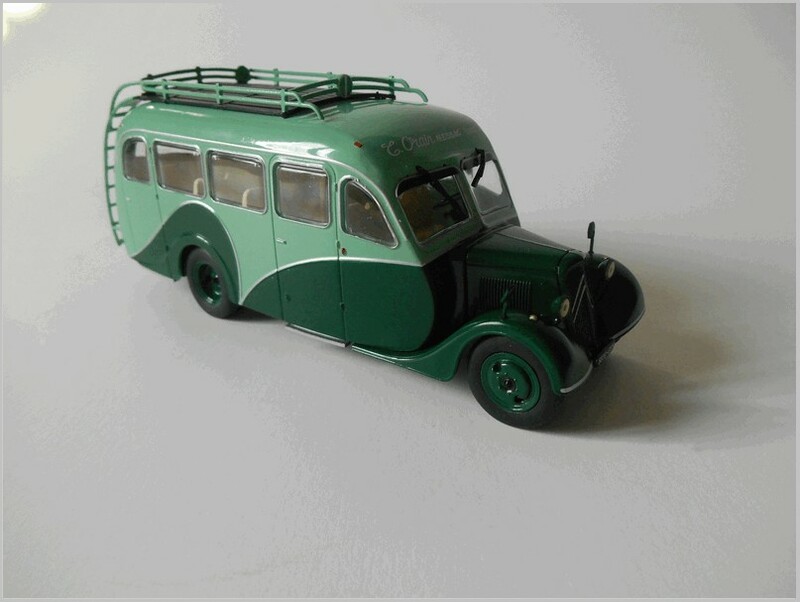 In 1927 he decided to build coaches on truck chassis by Panhard, Citroën and Renault. In 1934 he swapped building wood framed bodywork for lighter and more resistant closed tubular metal structures using electrical welding and patenting the procedure. In 1938, at the International Fair of Lyon, Joseph Besset presented the first European coach with an integral structure with engine at the rear located in a cantilever : the Isobloc (see part 6, no. 17). But in 1951 competition forced Besset to cease his activities. The company changed names several times and became Floirat, then SACA, Saviem, Renault Industrial Vehicles, Irisbus-Iveco and since 2013 Iveco Bus. This is a weighty but small model compared to the Van Hool. It captures the line well with sympathy for the exaggerated lines of the dark green and light green livery. It is based on a coach preserved by the Orain company of Messac (Ille-et-Villaine), while another one is in the Annonay museum. 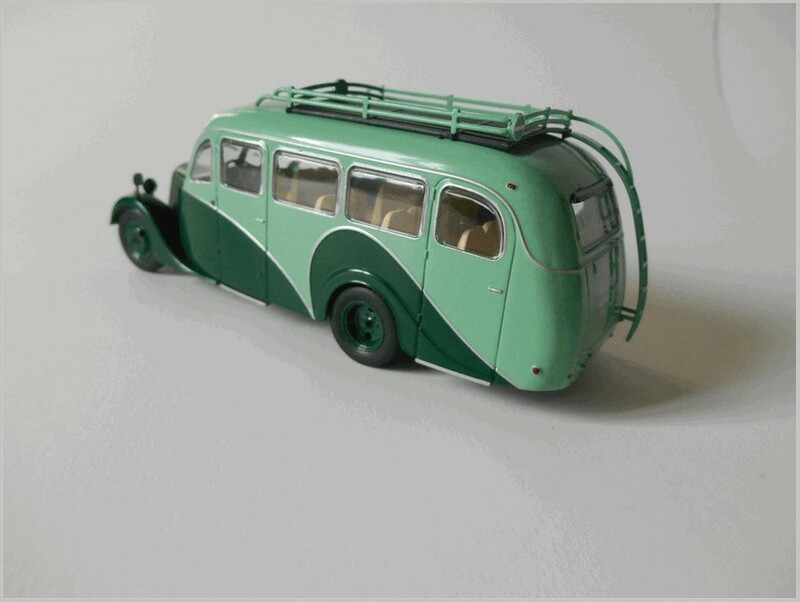 Metal body and plastic chassis, with a simulated spare wheel under the chassis. The driver area is well reproduced, with nice passenger seats. The registration plate is from Ille-et-Villaine, a department located in Brittany, in the northwest of France. A very nice radiator grille is fitted and the front lights are quite fine. As usual there are many added parts, like lights, mirrors, wipers and a large rear ladder to reach the baggage area over the black roof. There are no apparent differences to the French edition. 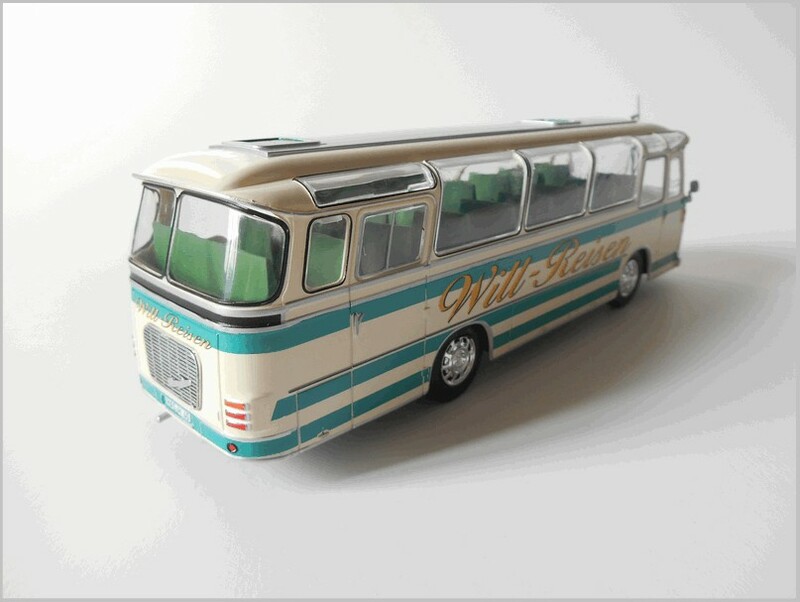 A very nice model, but perhaps a lighter livery would improve its appearance. No. 51 (no. 40 in the French collection) Neoplan NH 9L 1964 – When we met the 1983 Neoplan NH 22 Skyliner (part nine, no. 27) we saw the Neoplan founder’s eldest son, Albrecht Auwärter, and the Swiss Bob Lee, developed a new coach as part of their dissertation at the Hamburg University. 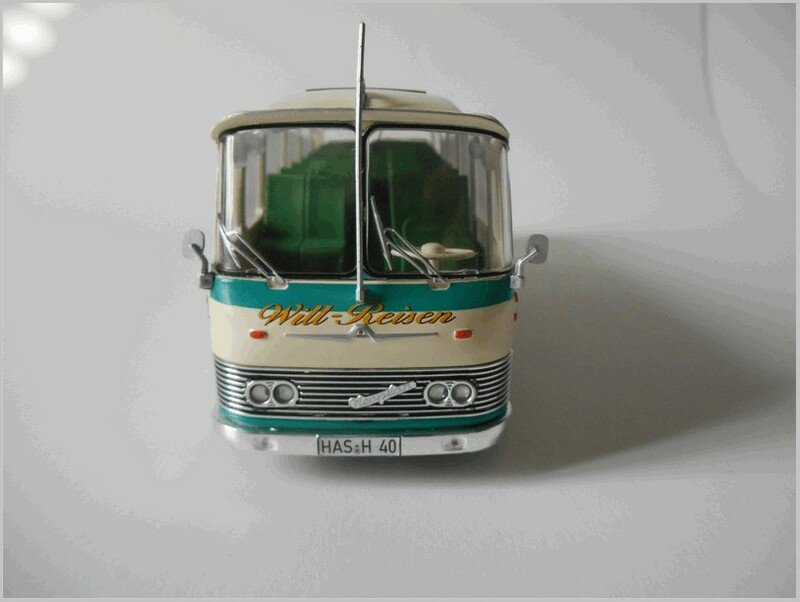 The “Hamburg” bus was unveiled at the Geneva Motor Show in 1961. Both Albrecht and Lee joined Neoplan after graduating from the university : Albrecht took over management of the company, and Bob Lee later became head of Engineering and Design. The NH range (Neoplan Hamburg) was characterised by clear-cut lines with straight edges and large windows, curved over the roof. From the beginning the NH was produced in four different lengths (from 8.16 to 12 metres) named NH 8, NH 9, NH 12 and NH 14 according to the number of rows of seats. All models had rear pneumatic springs and Henschel straight six diesel engines with 115-180 CV. The NH 9 was the most successful, but at the end of the 60s competition forced Neoplan to substitute it with the NH 10, which was able to carry more passengers. The NB range replaced the NH range in 1971 and the Henschel engines were replaced by Daimler Benz ones. Henschel was founded in 1810 in Kassel, producing locomotives among other things, then developed trucks and buses, both before and after the second world war, and diesel engines following the issuing of a Lanova license, but at the end of the 60s it was absorbed bit by bit by Daimler Benz. 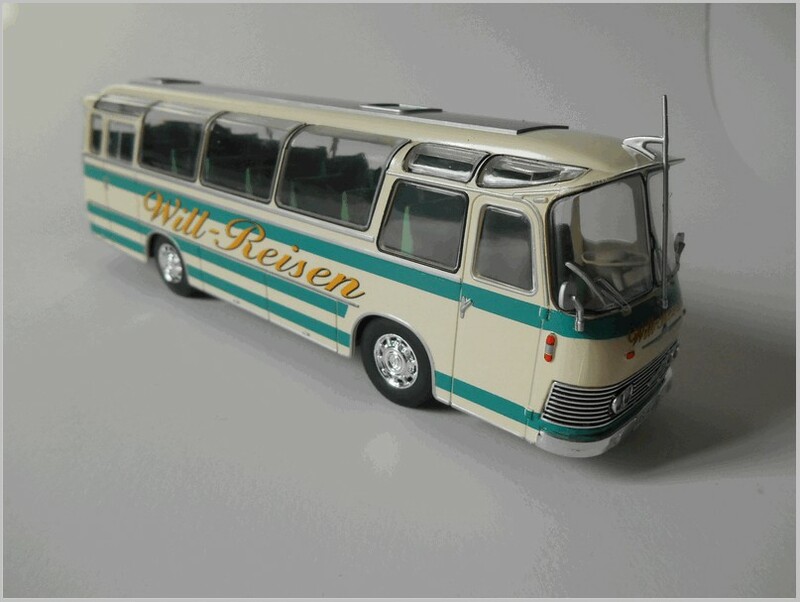 The scale model is shaped accurately and the cream and green livery appears authentic and neatly printed. 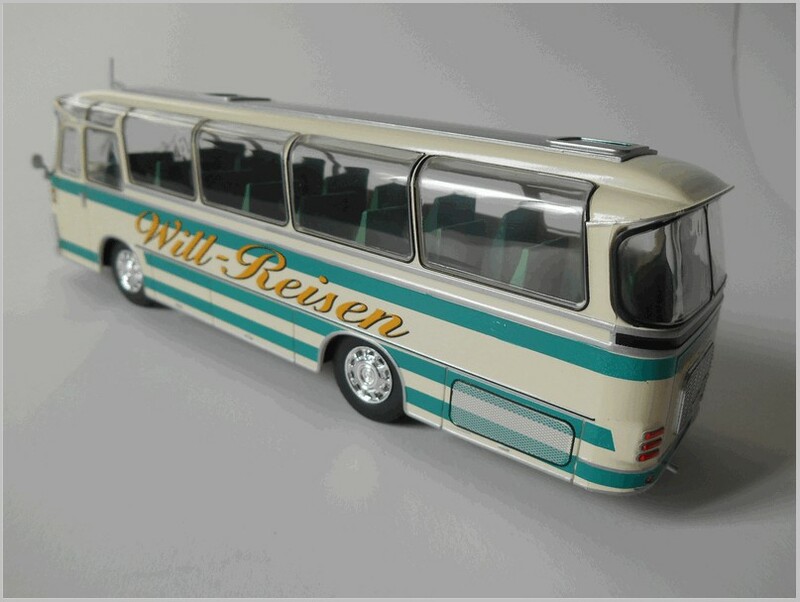 It is a faithful reproduction of a bus preserved by Will-Reisen, a travel company from Haßfurt, a town in Bavaria, Germany, capital of the Haßberge district. The body is plastic, as usual, with a metal baseplate with limited details. The silver roof is a separate part. Many more small plastic separate parts are fitted, like exhaust, wipers, mirrors, lights and bumpers, plus a very large antenna in front. The Henschel scripts over the front and rear grilles are rather crude..
A basic interior is fitted and the steering wheel seems to be a bit too large. Nice wheel covers are fitted. There is an accurate German registration plate for the Haßberge district. There are no apparent differences to the French edition. A nice model, quite representative of 1960s technology.